Need a digital signage solution for your large hotel, casino, restaurant chain, educational campus or corporate office building? You need Inspire Enterprise Solutions Suite and Enterprise Services! Are you looking for a digital signage solution perfect for malls, airports, hotels, stadiums to display information or advertisements? Do you need full service, remote technical support and large project management? Well this is why we created Inspire Enterprise Solutions Suite and Enterprise Services. Our dedicated team of digital signage specialists can provide custom digital signage solutions using our state of the art digital signage platform! Our digital signage software makes it possible to deliver the right message to an appropriate location at the most opportune time to inform, entertain, and connect with an audience. From one custom touchscreen kiosk, to an enterprise of multi-property systems with hundreds of signs, we have several software options that are each geared at making it easy to manage your signs. Take a look at our Inspire Enterprise Solutions platform and our many interactive Apps to provide a package that fits your needs. 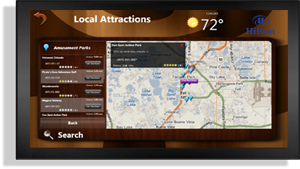 Create a custom touchscreen menu, wayfinding map or digital advertisement. You no longer need a custom application. You our drop and drag editor to create colorful and engaging digital content. Please email our sales department for more information about our Inspire Enterprise Solutions Suite and Enterprise Services. 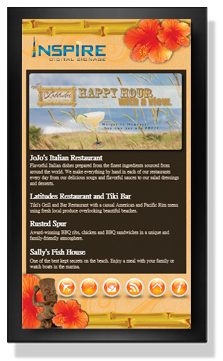 Do you need digital signage software for your small coffee shop, restaurant or retail boutique? Inspire Desktop Suite is for you! 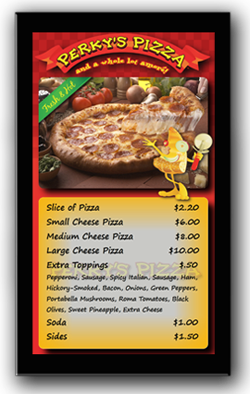 Need a simple digital signage solution? Tired of paying monthly fees? Would you like to control unlimited signs from your workstation desktop? 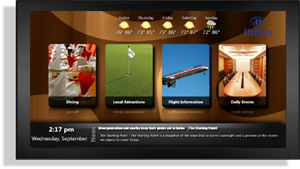 Want to build your own touchscreen and interactive content? 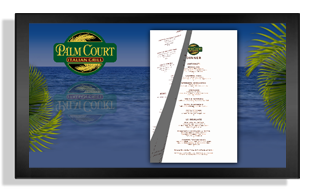 • Attract guests with large format LCD panels. • Cost effective 24/7 digital concierge. Who benefits from our software solutions? Finding innovative ways to communicate with your guests and patrons will distinguish your brand and help create customer loyalty, digital signage provides a platform that can help you achieve that. Digital signage has been effectively used to increase sales, influence behavior, communicate with staff, reinforce brand and product recognition, upsell products and services, as well as many other uses.